After a three year delay, Canon's finally introduced the successor to the Powershot D10. The D20 packs some much-needed improvements in a budget-friendly package. The D20 might not be the most rugged camera in its class, but it will do the job for users who want a casual portable camera. It provides a lot of niche features such as a built-in LCD, GPS, and point-blank focusing, while sacrificing image quality and stabilization. Despite being on the low end of Canon's offerings, it's still a good choice for most photographers. The D20 has a wavy design that makes it look aquatic. 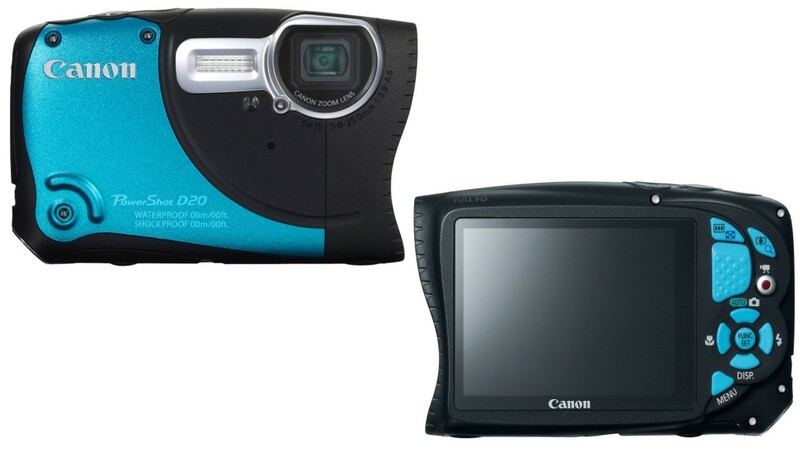 The front features the lens and flash, while the back is home to a 3" LCD screen and an array of navigation buttons. The camera is waterproof, shockproof, dustproof, and freeze-resistant, while an optional underwater housing lets you take it even deeper. The D20 films video at a less-than-ideal 24 fps for 1080p video. At 720p this cap increases to 30fps and skyrockets at lower resolutions, ultimately capping out at 240fps for 240p video. In other words, if you want to film slow-motion video, you'll have to do so at an extremely low resolution. For photos, Canon includes an array of features and modes for customizing the quality of your images. The D20 features optical zoom in addition to digital zoom, automatic scene detection, blink and face detection, fish-eye effects, and a variety of resolutions and aspect ratios with a maximum of 4000x3000 pixels. Despite its status as Canon's low-end offering, the D20 is tougher than many action cameras. Its rechargeable battery lasts for a whopping 5 hours on a single charge. The camera starts recording in 1.5 seconds and has a 0.2 second shutter speed, making it good but not great for snapping quick pictures or videos. The D20 doesn't offer much in the way of add-ons and accessories. Canon offers a waterproof casing, external flashes for low-light photos, and additional battery packs. Audio leaves a lot to be desired due to the mono microphone, and this is only made worse when using the waterproof casing. For the price, though, it's hard to argue that any of these will be a deal breaker. The D20 represents the low tier of Canon's offerings, but it still has enough capability to stand on its own. For photographers who are looking for a reliable budget camera that's good in most environments, this is a good option. Enthusiasts who need more control over their camera and more options for mounting might want to look elsewhere.